Thanksgiving is tomorrow! Maybe it’s becuase I follow every food blog and magazine I can, but does it feel like people are even more food-obsessed this year than most? Bon Appétit has a Thanksgiving app, Food52 has been emailing a Holiday Cheat Sheet for weeks, and Slate has many strong directives for the holiday including a commanding no-apple-pie-on-Thanksgiving rule that almost made me call my mother and tell her to switch plans. I’m pretty sure the first Thanksgiving didn’t come with such high standards. And they certainly didn’t have so much food to go around that they needed to wear velvet track suits and diapers to stretch for the marathon of indulgence. Say it with me – woo sah. I’m staying in New York this year and hosting a Friendsgiving at my place. It’s the first time in 7 years of NYC that I’m not going home, but I really wanted to see the parade for once – and also I hate holiday traffic on the bus to/from Washington, DC. I don’t usually share my menu before any main event, but it might give you comfort and direction to know that I haven’t been shopping yet and plan to go to that parade, make all this, and have it on the table by 7pm. And I’m going to have the table set like a pro. Pears with brie/goat cheese/blue cheese wrapped in prosciutto with honey and fresh thyme. Bread Rolls spiced and shaped like little pumpkins. Salad?? Maybe I’ll ask a guest to bring something light and fresh. Some sort of Root Vegetable Dressing/Panzanella/Hash seasoned up like this recipe from Brooklyn Supper. Mac ‘n Greens like the dish at Red Rooster, but in the same casserole dish. Yes, this is my excuse to cook macaroni and cheese. If I had an excuse to also serve a ham I would. Cranberry Relish (Achar) – a Bengali take from my friend Naureen. 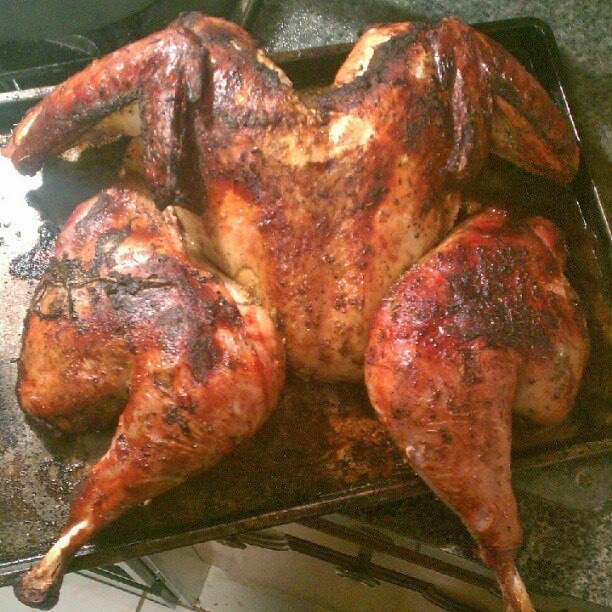 Roasting a whole turkey with stuffing? Ain’t nobody got time for that. This method drops the time dramatically so you can use your oven for other dishes. Coriander Spiced, Butterflied Turkey. The cooking time drops to about 90 minutes when you roast it straight over the oven grates (with a pan on the lower rack). The method is loosely based on a recipe from Alton Brown – 425 degrees for 30 minutes, then 350 degrees for 40-50 minutes, or until it reaches 165 degrees. Then let it rest for at least 30 minutes before carving. I’m going to try a dry brine overnight. Gravy made from the turkey drippings and stock I’ll make from the backbone, neckbone, and giblets with the same spices as the turkey. And finally, Pecan Pie from my friend Ayo with ice cream cocktails from another dinner guest. This looks delish!! We use an electric roaster for our turkey, it cooks perfectly but doesn’t brown as nicely.